On any given day, the halls of OGIO are a veritable who's who in the world of professional sports. Whether it is X Games Gold medalists Travis Pastrana, Eric Koston, or Bob Burnquist just stopping in to consult on their latest designs to Eero Ettala and Travis Pastrana testing out new moves at the OGIO training facility, the place is always buzzing with activity. OGIO company While this might be the norm in other worlds, until recently it has been uncharted territory for an action sports company which exclusively sells gear bags. 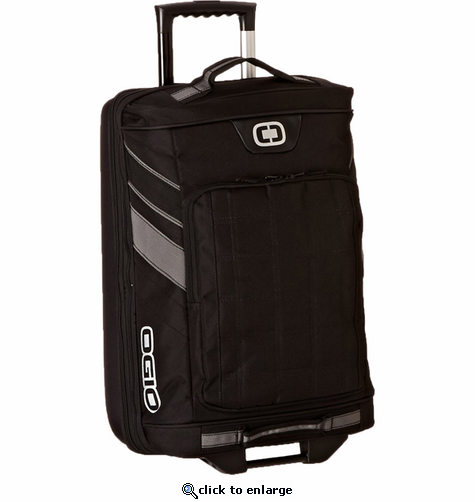 Utah-based OGIO was created in 1987 by Mike Pratt a born thrill-seeker and frustrated inventor who needed an outlet for his ideas. His first innovation was a sport bag designed to look and work like a locker. It was a simple concept, yet something entirely new for a tired-looking industry. Fortunately, buyers at Nordstrom saw its potential, and a company was born. In the years that followed, Pratt's newly-named OGIO powered out backpacks, duffel bags and apparel. The brand nailed its real traction when the founder and his new design team started pouring serious innovation into niche categories including motocross, snowboarding, golf, skate, and surf. OGIO sponsor some of the world's finest extreme sports athletes, all of whom choose to use OGIO gear. They live to push the boundaries of extreme sports further than the competition, and to do that they ensure they only use the finest kit. OGIO has been the gear bag of choice for these athletes for over 2 decades now and has been at the forefront of bag design and innovation since 1987. Here in the UK, we follow in the same tradition, by supporting some for the best athletes the UK has to offer. Ben Reid, Josh Brycland, Steve Peat and Paddy Graham are all at the forefront of their chosen disciplines and we are proud to be able to support them with OGIO product. OGIO International guarantees its entire *non-golf line of products for the **lifetime of the product (original sales receipt required). This warranty covers the product for the original owner against defects in materials and workmanship only. If the product ever fails due to a manufacturing or material defect, then OGIO will replace with like product at our discretion. This warranty does not cover damage caused by normal wear and tear, accident, improper use, or the natural break down of colors and materials over time.